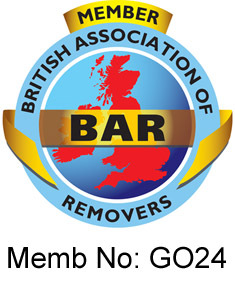 Gosdens are proud to be members of the British Association of Removers and display the BAR emblem with pride. Originally formed in 1900 as the Furniture Warehouseman & Removers Association Ltd (FWRA), the present day British Association of Removers attends equally to the interests of BAR members and those of member's clients. Looking through the BAR website will show that BAR membership is not just a matter of paying subs and displaying the badge. To become a member of the BAR removers must meet strict requirements and adhere to stringent rules. Checks are regularly made to ensure that members are providing a superior service. All BAR members are members of the BAR Advanced Payment Guarantee scheme. It is usual practice in the removals industry for a mover to request full customer payment prior to a move taking place. The BAR Advanced Payment Guarantee scheme protects this pre-payment. In the event that your selected BAR Member company were to fail financially prior to fulfilling your removal contract, that advanced payment will be protected by this scheme.